The majority of us use staircases each and every day of our lives, and think nothing of it as we rhythmically tap our feet on our ascent or descent. However, they needn't be the bland, everyday object that many people envision them to be. 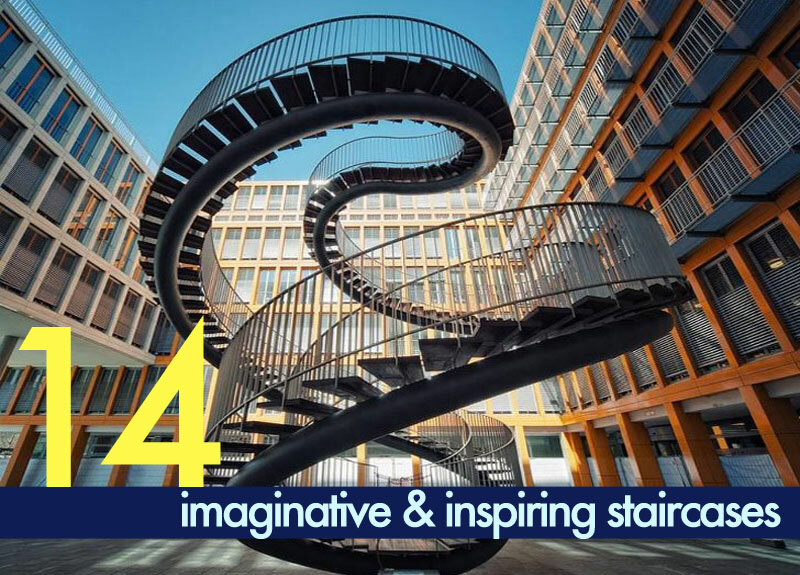 What some see as a necessity, others have seen as a design opportunity, which has resulted in the creation of stunning staircases that transcend function to become the focal point of the room. Read on for a look at 14 of the most unique, imaginative, and sustainable staircases around the world! This post was written by Anne of AH Interiors, an interior designer with other 20 years of experience, based in Henley-on-Thames, England. 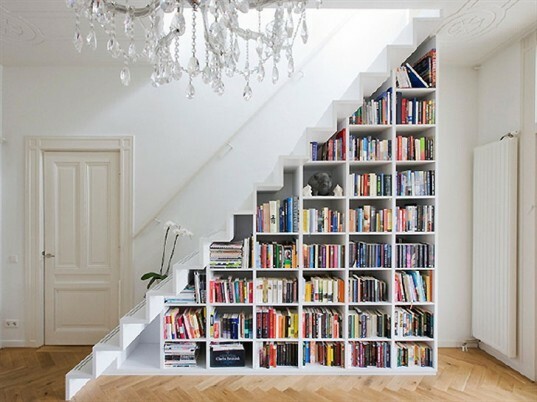 This staircase makes great use of a tight space, doubling up as a clever and aesthetically pleasing bookcase. The staircase is almost halved in length by using alternating steps, and despite numerous questions being raised about their safety, it fortunately falls within building safety codes. 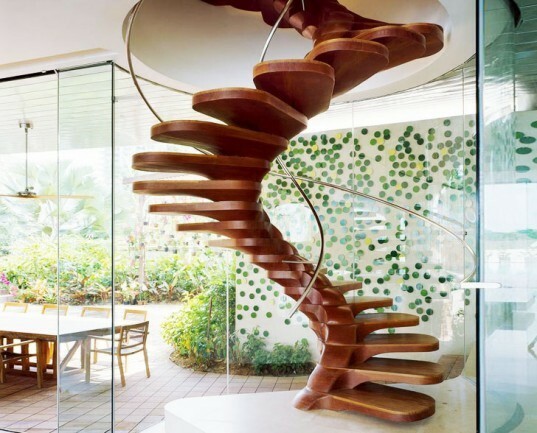 This spiral staircase by Patrick Jouin not only looks great – it also helps maintain the light open space. The central spine is effective at supporting its twists and cantilevers, and it has a sweeping steel hand rail fixed through its center. 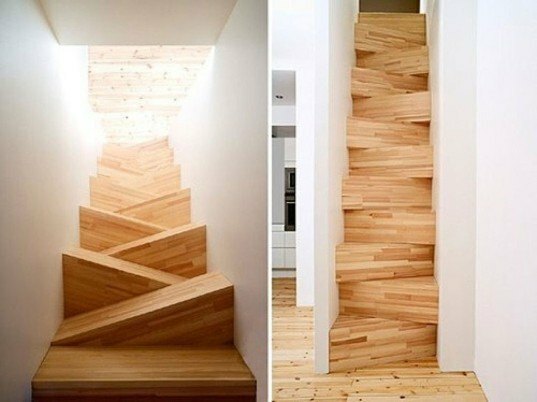 Safety aside, you can’t deny that these jagged wooden stairs look fantastic. The design is an interesting take on the alternating steps approach, which minimizes the space required for the installation. 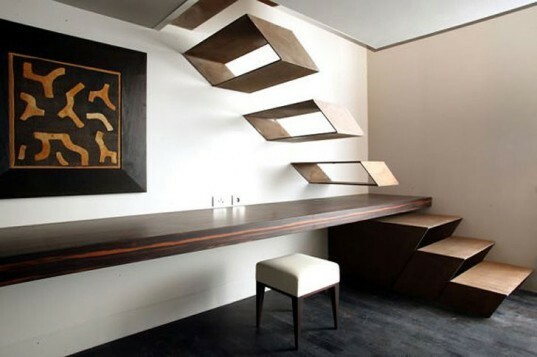 This staircase cleverly builds upon an existing installation, and the hollow steps could easily be used as shelving. When viewed from a certain angle, each step appears to float in the air. The overall design was flawlessly implemented by Florence-based architect, Guido Ciompi. Part of the Tate Modern’s Unilever Series, these huge slides by Carsten Höller are impressive sculptures in their own right. Höller has installed over six slides in various museums and galleries around the world, due to his fascination in the state of simultaneous delight and anxiousness experienced by the sliders. 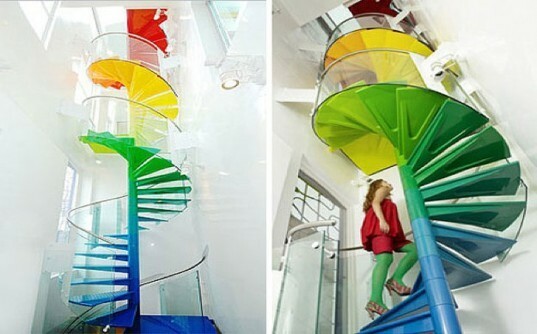 These bland white walls are brought to life with an overload of color from this rainbow spiral staircase. The installation is part of AB Rogers and DA studio‘s so-called Rainbow House, which is full of secret doors, slides and ladders. 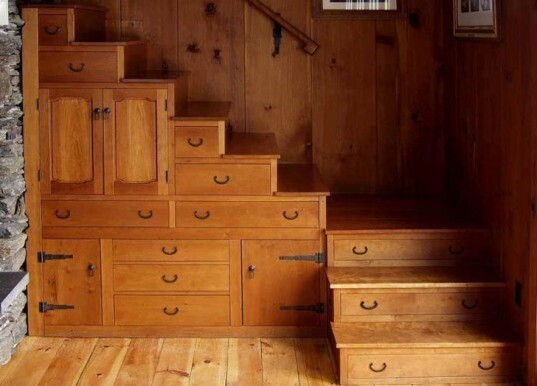 These bare wooden steps consist of carefully placed storage solutions, which adopt the form of a ‘Tansu’ cabinet. Tansu is the word commonly associated with traditional mobile storage solutions from Japan. 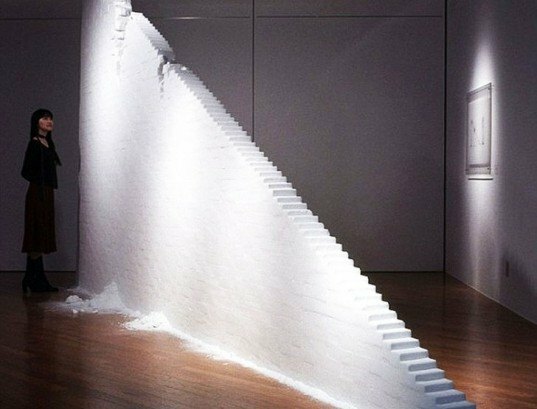 This crumbling art installation is a staircase created purely from salt, and is the result of hours of work. Japanese artist Motoi Yamamotobegan working with salt after tragically losing his sister to brain cancer. He creates intricate art installations to honor her memory and keep his mind busy. 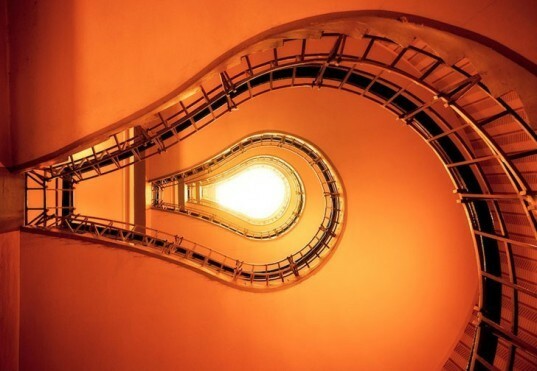 The designer of this staircase was clearly trying to replicate the shape of a light bulb. Located in the inner city of Prague, the installation was perfectly captured by photographer Dennis Fisher. A dozen timeless classics were the inspiration for this staircase’s décor. It’s an inexpensive yet effective way to add character to an otherwise dull space. 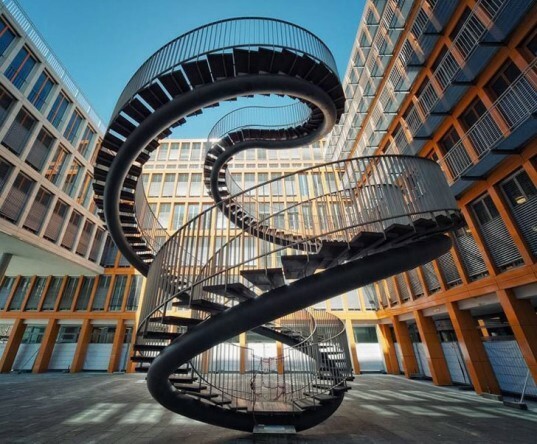 Although this staircase to nowhere by Olafur Eliasson located in Munich may seem rather pointless, its spiraling form is rather breathtaking. This clinically white staircase fully utilizes the otherwise empty void beneath to provide a smart storage solution. From a distance you would be forgiven for mistaking this steel structure for a roller coaster, but this public art sculpture titled ‘Crouching Tiger and Turtle’ is far from a high-octane experience. Located in Duisberg, Germany it encourages people to endure a mild workout while taking in its clever and intricate design. We hope this collection of remarkable staircases has inspired you to think outside the box, and urged you to look at these everyday objects in a different light. very nice staircase, my passion is solid wooden supporting staircases. 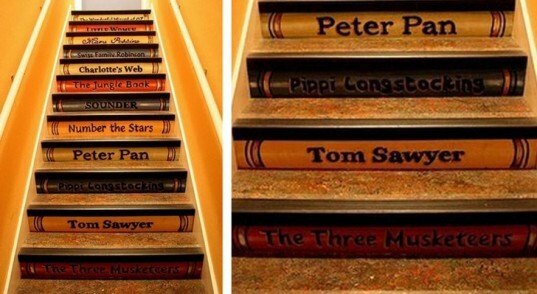 Very interesting staircases. 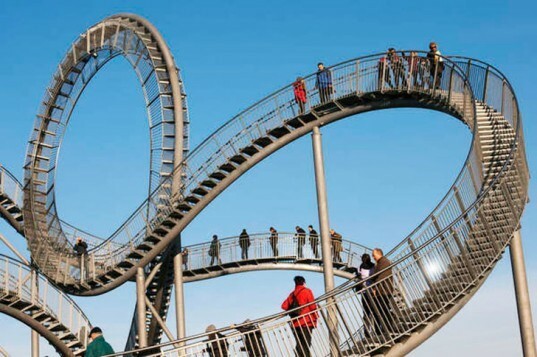 The rollercoaster staircase is quite bizarre, wouldn't want to go through the loop on that one! Some are quite nifty though, I'd propose checking out http://www.eestairs.com out as well, if you like to look at unique staircases. 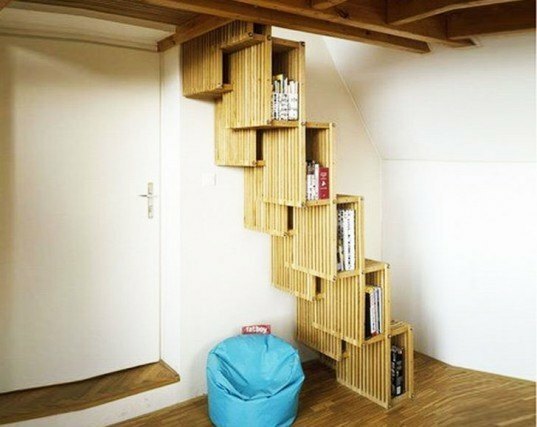 Oh!, It'd be cool if the slatted bookcase stairs were made of Bamboo! 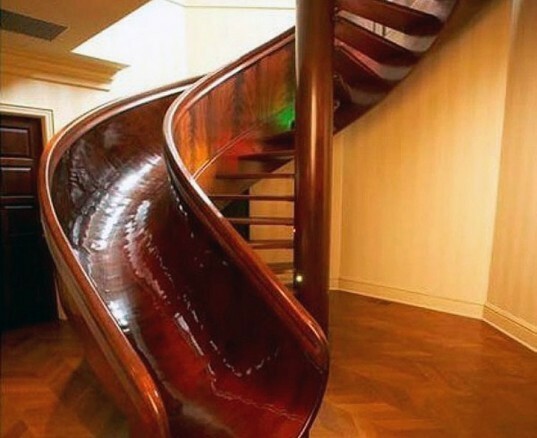 Not only does this spiral staircase made from highly polished dark wood look great - it also adds an element of fun that is rarely seen in such installations. Wood worker Rodney Miller was faced with the task of bringing the 27 ft design to life for Scott Jones, the inventor of voice mail. The project was 15 months in the making. Spiral Wood Staircase by Patrick Jouin This spiral staircase by Patrick Jouin not only looks great - it also helps maintain the light open space. The central spine is effective at supporting its twists and cantilevers, and it has a sweeping steel hand rail fixed through its center. Jagged Wooden Staircase Safety aside, you can’t deny that these jagged wooden stairs look fantastic. The design is an interesting take on the alternating steps approach, which minimizes the space required for the installation. Void Staircase by Guido Ciompi for The Gray Hotel in Milan, Italy This staircase cleverly builds upon an existing installation, and the hollow steps could easily be used as shelving. When viewed from a certain angle, each step appears to float in the air. The overall design was flawlessly implemented by Florence-based architect, Guido Ciompi. Tate Modern slide Staircase by Carsten Holler Part of the Tate Modern’s Unilever Series, these huge slides by Carsten Höller are impressive sculptures in their own right. 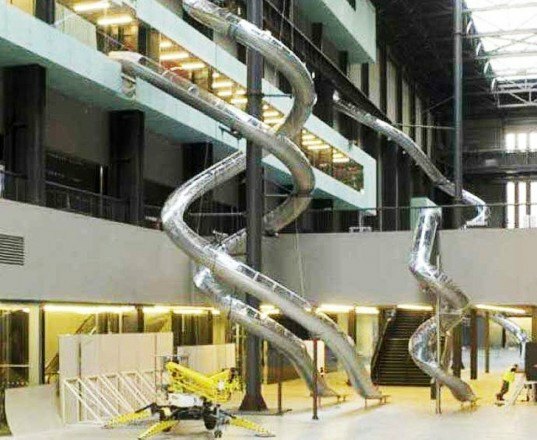 Höller has installed over six slides in various museums and galleries around the world, due to his fascination in the state of simultaneous delight and anxiousness experienced by the sliders. Rainbow Spiral Staircase by AB Rogers and DA Studio These bland white walls are brought to life with an overload of color from this rainbow spiral staircase. The installation is part of AB Rogers and DA studio's so-called Rainbow House, which is full of secret doors, slides and ladders. Tansu Cabinet Staircase by Dan Mosenheim These bare wooden steps consist of carefully placed storage solutions, which adopt the form of a ‘Tansu’ cabinet. Tansu is the word commonly associated with traditional mobile storage solutions from Japan. Salt Staircase by Motoi Yamamoto This crumbling art installation is a staircase created purely from salt, and is the result of hours of work. Japanese artist Motoi Yamamotobegan working with salt after tragically losing his sister to brain cancer. He creates intricate art installations to honor her memory and keep his mind busy. Light Bulb Staircase The designer of this staircase was clearly trying to replicate the shape of a light bulb. Located in the inner city of Prague, the installation was perfectly captured by photographer Dennis Fisher. Storybook Staircase A dozen timeless classics were the inspiration for this staircase’s décor. It's an inexpensive yet effective way to add character to an otherwise dull space. A dozen timeless classics were the inspiration for this staircase’s décor. It's an inexpensive yet effective way to add character to an otherwise dull space. Spiral Staircase to Nowhere by Olafur Eliasson Although this staircase to nowhere by Olafur Eliasson located in Munich may seem rather pointless, its spiraling form is rather breathtaking. White Bookshelf Staircase This clinically white staircase fully utilizes the otherwise empty void beneath to provide a smart storage solution. Flying Roller Coaster Staircase by Ulrich Genth and Heike Mutter From a distance you would be forgiven for mistaking this steel structure for a roller coaster, but this public art sculpture titled ‘Crouching Tiger and Turtle’ is far from a high octane experience. Located in Duisberg, Germany it encourages people to endure a mild workout while taking in its clever and intricate design.